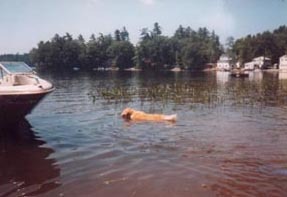 Amber is a Golden Retriever and was born on May 15, 1996, she was one of 9. There were 6 boys and 3 girls, but during the delivery one of the boys died. They each weighed between 16-17 ounces, with the boys weighing slightly more then the girls. We had spoken to a Breeder from Framingham, Mass., several times to see how Mom and babies were doing, and they were all doing just fine. 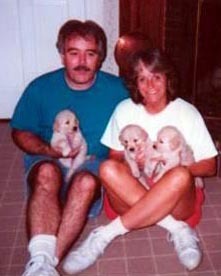 I r emember when I did call the Breeder that I could hear the puppies crying in the background, it was so exciting. The Breeder was taking pictures for us, so we could see their progress. At this time all we knew was that we wanted a girl. The first time we went to visit the puppies they were about 4 weeks old. They were all so cute, and we wished we could have taken them all home. The three girls were taken out of the pen, for us to look at and decide which one we wanted. We picked the one with the purple collar (they all had different colors-girls were purple, pink, & white). Amber (on left) with 2 of her littermates, my husband & I. We enrolled Amber in Puppy Kindergarten, Concord, Mass. The Breeder advised it to all new owners. These classes were for Golden Retrievers only! The first class June 27, 1996 was a bit strange as it was without our puppies, and we hadn’t even picked up Amber yet. On June 29th, we went to pick up Amber to bring her home. Amber was an early Birthday gift for my son Richard, who was turning 16 in October. Oh boy was he surprised! By this point Amber now weighs about 7 pounds, and is a little butterball. The 2nd class, but 1st with puppies, was great Amber had a chance to see 3 of her littermates again. When they were playing it appeared they remembered each other, it was lots of fun watching them interact. It was fun to see all these Goldens, different sizes and colors. It is amazing the variety of colors there are out there. During the last class they had someone there to tattoo your dog if you wanted. We did choose to have Amber Tattooed. We had heard some horror stories of dogs being stolen. We even heard that they use to tattoo a dog’s leg, but this wasn’t working, as the people steeling the dogs would cut off the limb above the tattoo. How cruel some people can be to do that to an innocent animal. 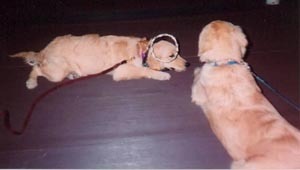 Amber learned certain commands quickly and not so well to others, but she did graduate. We were so proud of her, and I think she might have even been proud of herself too. Amber was growing up so quickly, it is truly amazing how fast they grow. They are not puppies for long, at least in size any way. Above, right: Amber with Rich, first time he has seen her. Doesn't he look happy? When Amber was brought home we were unsure how our 10-year-old cat Jingles and our 4-year-old cat Puff would react to her. It went very well, better then we had anticipated. Maybe because Amber was smaller then Jingles, and about the same size as Puff, not sure. Amber would tease Jingles as she wanted to play but Jingles didn’t have the same idea in mind. Not once though did Jingles scratch Amber, and there were times she probably deserved it. Jingles would just sit and watch Amber jumping around and sometimes they would both paw at each other. Puff on the other hand was not as tolerant of Amber, and would hiss, growl, hunch up her back, swat at Amber and scratch her if she got close enough. One time is all it took and Amber knew how close she could get without it happening again. Amber loved to tease Puff, and try and play with Jingles when ever she could. On September 26th Amber started First Grade classes. 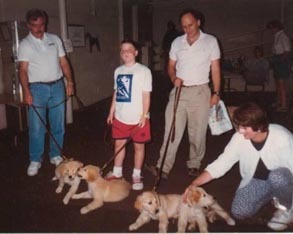 These classes were also for Golden Retrievers only. She did very well but again she was more proficient at some commands and needed work on others. They had a Halloween Party, as it was the last class and it was also Halloween night. Some of the dogs dressed up; Amber was dressed as an Angel. She didn’t like the halo too much though. We worked on the commands at home, and she managed to graduate First Grade. I think Amber liked the socialization the most, running and playing with the other dogs. an Angel. Not too happy with the halo over her head. Amber was growing so fast, that her being a puppy seemed to be non existent. She enjoyed playing with two Goldens, Mandy and Shannon who lived down the street from us. They would play together as much as we had time for. Every time we walked by their house Amber would drag us up their driveway. Some times Richard would take Amber with him when doing his paper route and let her play with a chocolate lab named Bailey. She met another Golden on one of our walks one day, his name was Churchill. She played with him from time to time too. 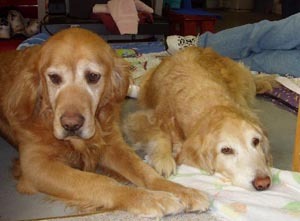 Amber always enjoyed playing with other dogs, and she would play hard and then be exhausted for several days. Amber was so much fun to have around, and made us laugh so much sometimes that we couldn’t stop. We would sit at the end of a day, and wonder what we did for entertainment before she came into our lives. She was far from perfect, and there were days that she tried our patience. She would sit and let you put eye glasses on her. Sometimes you could manage to get her to leave a hat on her head. If the hat had a tassel or ball on the end forget it, she would remove it from who ever had it on their head. 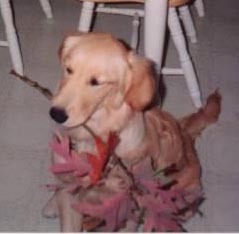 She would chase leaves and pick up branches and carry them in her mouth while we were out for walks. Size of the branch did not matter in the least. 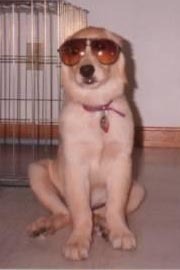 Amber wearing Daddy's sunglasses. Ready for the sun. Left: Amber wearing Daddy's glasses. Doesn't she look cute? Amber was pretty healthy, a few UTI’s, within the first year of her life. Bee stings, hot spots etc… She loved to dig in our back yard, and not just around the perimeter but all over. We had these fox holes as we called them all over our yard from her. So if we were playing ball with her, you needed to be careful you didn’t fall into one. Between the digging and pushing on the chain link fence, she would end up in our neighbor’s yard. Good thing their yard was fenced in too. We had to have a rail put along the bottom of our fence to keep her in our yard. She pulled up several of my azalea bushes, and flowers. She scratched the front of our new dishwasher, as she was mad, we had company and left the kitchen without her. She would tear apart some of her toys when left alone. She would jump on our storm door, and destroyed the screen at least twice. She even destroyed a pair of my slippers. My fault as I shouldn’t have left them out, to give her the opportunity. She loved playing with socks, but not to a point of destroying them, she liked tossing them in the air, or just walking around with them. If you told her to go get the socks she would. Never was able to teach her to get our slippers though. Amber had some fears from the beginning. She disliked loud noises, which was a slight problem as we were not to far from a busy street. Lots of trucks, motorcycles etc… She hated fireworks, thunder, and balloons. We felt so bad for her, that sometimes we had to give her medication to calm her down. She also didn’t like to go into the pet store, and we tried several times. We would walk in the door, and she wanted to leave immediately. She was not too thrilled about the vet’s office either, although this came a little later. Amber loved to play ball, and Frisbee, and became very good at bringing it back to you, so you could throw it again and again. When she was tired she would go lay down on the ball, rest for a bit and then want to play again. She also did quite well at catching the Frisbee. She enjoyed playing hide and seek, and was pretty good about finding you. We sometimes would hide her treats and she would sniff them out until she found all of them. There were a few tricks and commands that she was very good at, like: sit, stay, off, leave it, drop it, wait, lie down, head down, paw, high five, give me ten, sit pretty, easy, balance and leave a cookie or treat on her nose until you said ok. When it was feeding time Amber would not appear in the Kitchen until she heard you putting the dry food in her bowl. When we put her food down, she wouldn’t touch it until we told her ok. If we were walking and we weren’t holding her leash, if you stopped she would to, and then turn and come to your side and sit. When she saw kids, if they wanted to pet her she would either sit, or lie down. 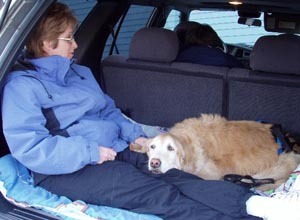 Amber loved to ride in the car, and go for walks. She loved to play in the snow, and if you made a snowball and threw it she would go fetch it. One day we made a snowman in our back yard and she kept barking at it. Liked the water, for the most part. We had a little kiddy pool for her and if you placed a rock in the water she would put her head under water to retrieve it. Once you started this game she wanted you to continue. She was not too thrilled about baths though, I think it was the rinsing off she disliked the most. Amber having her first bath. One day we went to visit some friends for the day; they had a place on a lake in NH. We arrived and our friends and their black lab named Max came to greet us. We started to head down to the lake, Amber running behind Max. Max jumps off the dock into the water Amber followed; she was stunned and petrified to say the least. She managed to swim in enough and wrapped her front legs around the posts of the dock. My husband had to help her to shore. She never did that again, only way she would go into the water was from the beach. And at that it took some persuasion on our part, and we had to be in the water. She never went too far from shore, the rest of the day. We went back to their cottage, the following year, but this time for several days, and our friends were not there. Amber still would not jump off the dock, but she did venture further off shore, this time but not too far. We had a great time, my husband, son, Amber and I. Every morning Amber would sit on the enclosed porch looking out the door at the lake. She drove me crazy until I took her outside. We had lots of trouble keeping her out of the water. 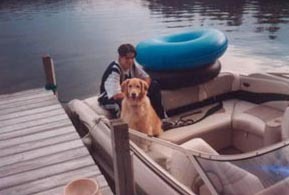 She would sit on the deck with me and would watch the boats, and kid’s water skiing and tubing. She even ventured onto their boat to sit with us and watch the goings on in the Lake. 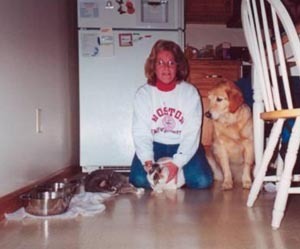 On November 11, 2000, we had to put our Cat Jingles to sleep. Amber seemed lost without Jingles, even Puff seemed a little off. Sometimes Amber and Jingles enjoyed sitting on the deck together. One day I forgot to put Jingles leash on him so he went down into the yard, Amber started to bark, to get my attention. I went outside and she was preventing Jingles from going under the gate. Jingles liked to be outside, but wasn’t allowed to roam, so the deck was our compromise. Amber and Jingles spent lots of time out there together. Both loved to be outside as long as it wasn’t too hot or cold. 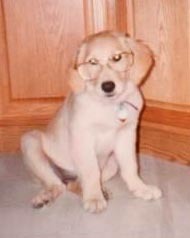 On September 22, 2001 we went to Yankee Golden Retriever Rescue (YGRR) in Hudson, Mass., to look at another Golden Retriever. We felt that Amber needed a playmate, as her other playmates had either moved or just didn’t have time to get together. 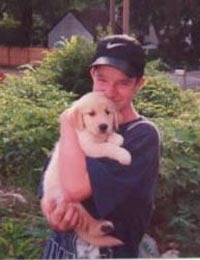 The dogs name was Dakota, and he was also 5 years old, 3 months younger then Amber. We brought Amber with us so she could meet Dakota. We needed to see if both dogs got along, and how they interacted together. They did ok together, but Amber was out of her natural surroundings with too many unfamiliar scents, so she was too busy sniffing around. We decided to take Dakota home with us. Within about 15 minutes of being back home and Amber being in her own yard she wanted to play with Dakota. Took Dakota a little more time to get use to her and us. They became the best of friends, and inseparable. They played well together, neither dog was possessive of their food, or toys and they never fought. It was double the trouble, but also double the fun. Dakota was completely different from Amber; they were like night and day. They each had their own beds, but sometimes you would find them both on the same one, together side by side. Dakota sometimes would rest his head on Ambers back. It was so cute! Dakota was not a digger, but Amber taught him how. Dakota would not jump up on furniture or bed, but Amber taught him how. We had hoped that Dakotas’s low key disposition would rub off on Amber, but instead some of Amber’s bad habits rubbed off on Dakota. 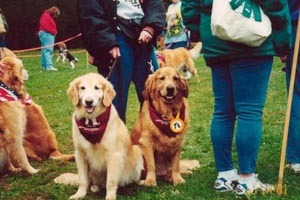 Above: Amber (on left) with Dakota. They had been playing in the back yard. October 2001 YGRR had a dog walk. 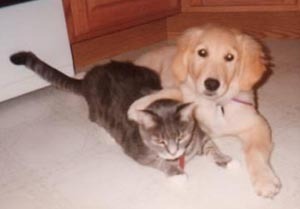 We decided to go as we rescued Dakota from them, and had been before when we first got Amber. Dakota marched in the parade of dogs, with lots of other rescue dogs. We had a great time; the weather was not the best though. But it is all for a good cause!! Amber and Dakota didn’t seem to mind too much, just enjoyed seeing all those goldens. We made plans to go away for 3 weeks, just my husband and I, which meant boarding Amber and Dakota. After checking out several places and much research we found a wonderful place in NH, about 45 minutes to1 hour away from our home. This was only the 2nd time Amber had been boarded; the first was for a weekend in May of 2003. She didn’t like it, she wouldn’t eat, and when we picked the dogs up Amber couldn’t wait to leave. So need less to say this made us concerned about going away for 3 weeks, and we almost canceled our trip. American K9 Country had what they called a play and stay, so the dogs would play with other dogs M-F from 7:00 AM-6: 00 PM, and only be in their kennels at night. The kennel was larger then most we had seen, so both our dogs could be together comfortably. They were let outside into the yard to do their business, but had the run area too, if they needed to do their business there. 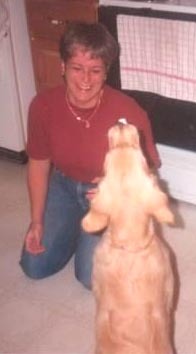 So on October 14, 2003 we packed their food, treats and a few toys into our SUV and headed to NH to American K9 Country. When we got there we went inside to check both dogs in, while they stayed in the car. We went outside to get them walked back inside and to our amazement Amber was wagging her tail and really happy. This was a really good sign, and made us very happy. We were still a little bit concerned that this was going to be a problem. They took Amber on the other side of this half door, she whined a bit, and they then opened another door. Behind this other door were several other dogs, Amber stayed at the door. Did the same process for Dakota; he did the same thing as Amber. We then noticed Amber going over to a few other dogs, sniffing and checking things out a little. We went outside to get their belongings, and looked inside the play area, and Amber was no where to be seen. She was out in the yard playing with the other dogs, happy as can be. This made us a bit more at ease about leaving them. We knew that Dakota would have an easier time with the situation, so we were not as concerned about him. Although he stayed in that room near the door and window looking for us, maybe thinking we were leaving him there for good. While on vacation, we checked on them several times, and they were doing great. As a matter of fact Amber didn’t want to come in at night, to be put into the kennel. The dogs were separated at mealtime, as we were afraid Dakota would eat Amber’s food if she didn’t. Amber did miss 1-2 meals, but Dakota didn’t miss any at all, big surprise! By the time the weekend rolled around they were exhausted. They were still taken out to a smaller yard during the off times, and Amber and Dakota had a chance to play for a while together, just the two of them. On November 3, 2003, the day before we were due to pick them up we got a call from American K9, stating that Amber had an accident. My heart started racing! “Is she ok? What happened? 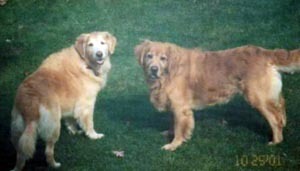 “Amber and Dakota were playing together just the two of them, and Amber let out a yelp, and she is unable to put all her weight on her front left leg. Doesn’t appear to be broken no swelling, no bleeding. It happened several hours ago, and she is able to put more weight on it now, but is limping quite a bit”. We called first thing the next day, and Amber seemed better, was able to put even more of her weight on it, but she is still limping, but still wants to go out and play. We picked both dogs up later that day, and they were both very happy to see us, but it seemed like Amber wanted to stay with her friends. She was limping to some degree, but was able to put most of her weight on her paw. After 2 days of her taking it easy, and still no improvement we decided to call the Vet to schedule an appt. On November 7th our local Vet saw Amber. Nothing was broken, and nothing obvious was going on. They gave us Etogesic for pain, to give to her as needed. They wanted to see her again 3 days later to take some x-rays. Over the weekend Amber didn’t need to take the pain meds to much. She was still limping but wanted to play with Dakota any way, and she was able to manage the stairs. On November 10th early AM we brought Amber to our local Vet again. We left her there, and they said they would call us late morning-early afternoon. At about 11:00 the phone rang, it was the Doctor and he wanted us to come in to discuss their findings. He said, “There is something that concerns me”. After trying to get several answers over the phone, he said “I think it would be better if you just come in, it would be easier if I could show you on the x-rays”. There was something in the tone in his voice that scared me. I called my husband at work to have him meet me at the Vets. To complicate matters, I had my 20-month-old Grandson, and no car seat. I called one of my neighbors that have two kids and asked if I could borrow one of their car seats. Car seat wasn’t really age appropriate, but at least my Grandson would be secured in a car seat. I was only going up the street and I felt that this was better then no car seat at all. I drove slowly, but my mind was racing, with thoughts of Cancer going through my mind. We went into one of the examining rooms; the Doctor entered with the x-rays. I remember seeing the look on his face and thinking he has really bad news. I had seen that look before when he told us Jingles had Cancer, and there was nothing that could be done. He put the x-rays on the view box; I didn’t see anything, no obvious breaks. I look at lots of x-rays in my profession, even if they are dental, and nothing jumped out at me. I remember thinking what could he possibly see on these x-rays, and why could he not talk to me on the phone? The Doctor then pointed out an area on her left shoulder (moth eaten) was the words he used, then the words Osteosarcoma-Bone Cancer! Well we were just in shock; my husband tried to get words out, but was so choked up he was having great difficulty. As for me I just stood there staring at the x-rays, dazed, then my eyes just started to fill up until I couldn’t see the x-rays any more. He also used the word Terminal!! That word with Cancer just blew me away. The Doctor then explained more about this form of Cancer-Osteosarcoma. He said he was 90% sure that this was the kind of Cancer it was, but there were other possibilities. He then explained treatment options, just Radiation, Amputation and Chemo. Amputation, was not what I expected to hear either, I was in shock. Our poor baby girl! He then explained that one of his dogs a Bull Mastiff had this type of Cancer, but the dog was too big for Amputation, so they did Radiation, it only bought him another 2 weeks more time. It sounded like it was the end of the world. He then said he can either let their Radiologist look at the x-rays, or he could refer us to an Oncologist in Waltham or Woburn, MA. We decided to go see the Oncologist, so we left with Amber, phone numbers, more Etogesic to continue giving Amber as needed for pain, our hearts cut out of our chest, and lots of info to digest. Now we also have the painful job of breaking this devastating news to my Son. After lots of tears, we discussed our options in great length. We were angry, upset, confused, and in disbelief that this was happening. We still had lots of questions, we started to think about what was said, and did we hear everything the Doctor said. We talked more and were convinced we would opt for the Amputation and Chemo, but needed more answers first. I was really angry we had gone away; we lost 3 precious weeks with our Amber. But on the other hand she had the best 3 weeks of her life, doing what she loved. I called to schedule an appointment with the Oncologist; we wanted to get her an appt. as soon as possible. On November 14th we to see the Oncologist with Amber and the x-rays from our Vets office. Amber was remarkably calm, lots calmer then at our Vets office, and much calmer then we were. We entered one of their examining rooms, where we spoke to the Doctor. He discussed the x-rays with us further; he had agreed with our Vet and also felt it was Osteosarcoma. We again discussed options, but this time we were calmer and able to ask questions. The options were the same as discussed with our local Vet, but more in depth as to which Chemo drugs could be used. We discussed Amputation, what to expect, and we were reassured that most dogs do remarkably well with 3 legs. Doctor also said that a bone biopsy would also have to be done before any treatment, so they can be 100% sure it is Osteosarcoma, and to know what we are dealing with, and what drugs to use. The Doctor. did want to take blood and more x-rays on Amber, wanted x-rays of her lungs, other leg, and another angle of her left leg. This form of Cancer always Metastasizes to the lungs, so before being able to decide which course of treatment to go with they needed to see the whole picture. So we then left her there for about an hour and came back to discuss the new x-rays. Went back into the exam room, more bad news, there was at least one suspect area on her lungs, of which the Doctor wanted the Radiologist to take a look at. Her heart looks good, other leg looks good, and other organs look ok. So we left with more info to read, and more discouraged then before and $400.00 poorer. We also had prices based on the different options, all of which were quite expensive, but well worth it if it keeps our Amber alive and with us for a longer period of time. Now the waiting game, until the Doctor calls with the findings from the Radiologist. Phone rang late morning on Monday November 17th the news was not good. The Radiologist reviewed Amber’s x-rays and saw 2-3 nodules, which means the Cancer has already metastasized to her lungs. Blood work came back fine; her organs are functioning the way they should be. Now we are left with no options but to keep her comfortable for her remaining days. We could try Radiation, but this will only make her more comfortable, and won’t cure her, and might not even buy her much more time. Maybe a few weeks or months, see better results with Chemo/Amputation. Back on this emotional roller coaster, walking on eggshells, waiting for the bomb to drop. Now the fun job of telling my son more bad news. Oh how we wished we could do the Amputation/Chemo right now and possibly have her life extended by 4- 6 months or maybe a year or longer. Amber now is on the Etogesic every day, and it seems to be working great, no side effects, and her limping is basically gone. We look at her and she looks perfectly healthy, but we know this Cancer is eating away at her leg, and lungs. Maybe this is all just a really bad dream. She gave us several scares, to a point that we thought this was it. One night my husband called me at work, to tell me he thought I should come right home; Amber is laying in the back yard and isn’t getting up. He called our local Vet and they were of no help, they were leaving for the night, all they did was give him two phone numbers of 24-hour Veterinary Hospitals. He called Amber several times, she was breathing, but Dakota was circling around her sniffing. He went into the basement to get a blanket to put on the floor, left the basement door open and proceeded to go out to the back yard to pick her up and bring her inside. Meanwhile I was on my way home from work, only a 10 minute drive, afraid that by the time I got home she would be gone, or that this was it. Then wondering if I should call my son, and get him over to our house. I decided to wait on calling my son, until after I got home and saw how Amber was doing. I pulled into the driveway, walked up the walkway into our back yard, no Amber. My heart sunk, I had a sick feeling in the pit of my stomach. I walked into the basement, and there she was as though nothing had happened, wagging her tail, and greeting me as she usually did. My husband on the other hand looked totally drained, and in shock, we feel she was playing head games with him. I called the Oncology group to speak to the Doctor I needed to know more about how much time we had with her, and what to expect. As of right now we are not enjoying her as much as we should because we are always in panic mode. He said that there was no reason we shouldn’t be able to get through the Holidays, into January. He wouldn’t say any more then that, but at least we felt like we could relax more and enjoy the time we had left. The Etogesic was still working and she seemed to be in no pain, was eating ok, able to go up the stairs. We did block off our deck stairs though as they were a little slippery at times, and both dogs would run up/down them, which made us really nervous. Amber is more at risk now of possably breaking her leg, if she runs down the stairs, or jumps off our bed or couch. Then on or about December 7th Amber was having difficulty with her back right leg; she was dragging her paw when walking, not a lot but enough that it was noticeable to us. We watched it for the rest of the day, and into the next day, nothing changed. She also had started to pause at the top of the stairs, as though she was afraid to go down, going up didn’t seem to be a problem. She was also having more difficulty lying down and getting up from a lying down position. We already had an appointment with the Oncologist for a follow up (1-month from diagnosis), on December 12th. I called the Oncologist to see if they could see her sooner, but they were out straight for the next few days, but I was told to try our local Vet, see if they could see her sooner, and access the situation. We got an appointment for the following morning. The next morning she seemed a little worse by dragging her paw more, but of course when we get to the Vets, she is showing very little sign if any of what we saw the past few days. She was jumping all over the place and was really active, but she did have an accident where she lost bowel control, this never happened before. The Doctor examined her, but couldn’t find anything conclusive. We left feeling like ok is she playing games with us again!! That night she was worse, having more difficulty walking, doing the stairs without assistance. I was scared to death, so I slept down stairs with her in the family room. The next morning, when I woke up, she had another accident, same as at the vets. She managed to get up with lots of difficulty; it was as thou she was paralyzed. I was hoping there wasn't any tumors, or Cancer that has now spread to her brain. I watched her then drag her behind across the kitchen floor, she was unable to walk too far without falling onto her behind. She was very unsteady, now my husband had to carry her down the stairs to let her out, and carry her back up the stairs. This upset me very much and I started to sob, to a point that I was unable to talk. I called the Oncology group again in a panic, basically demanding that she needed to be seen by someone, as we knew that Amber’s Oncology Doctor was not there on Weds. They said they would talk to one of the Doctors, and call us right back, of which they did like 5 minutes later. The Doctor felt that Amber should have more x-rays, but she didn’t have enough available time in her schedule to spend with Amber. The Doctor’s advice was to bring Amber to the Emergency Center right next door to them. This way the Doctor can fill them in on what has been going on with Amber, and she will also be able to work with them on Amber’s case. We called the Emergency Center to make sure they were able to see her. We were told that it was quiet there, so we left our house right away. When we arrived, Amber was dragging her leg and doing all the things she had been doing at home, at least now they can see exactly what her condition is and maybe give us some answers. Amber had an accident there too (bowel movement), it was as though she had no control of this function. The Doctor examined her, by moving around her legs, and pushing on her back, there was one area that Amber winced when she pushed. She wanted to repeat the x-rays, and blood work, to see if anything had changed, and get a few other x-rays of her back. We waited while this was being done to our baby girl. We now feel so helpless, confused, and we feel like we are being pulled from every direction. How our Amber could be completely fine 2 months ago, and now this, our lives have been torn apart. We now go back in to talk to the Doctor nothing shows up on the x-rays on her back, left leg, and lungs are slightly worse, blood work no change. I hope it is just a bad dream and I will wake up and everything will be ok. The Doctor recommended us to let them do the Bone Biopsy to confirm 100% that this is Osteosarcoma. We would either have to leave her over night or bring her back tomorrow, not sure what time the procedure will be done. We decided to leave Amber there overnight, so she could rest, and I could get a good night’s sleep, hopefully, plus both my husband and I had to work the next day. This just seemed easier all around, incase they could do it first thing in the AM. We explained to them, she might not eat, because of the surroundings. We called later that night to check on Amber, she was doing ok. She did eat, but they had to hand feed her, boy is she milking this one. That’s our girl!! The little Princess!! We called again in the morning before going to work, and they said she had an uneventful evening. The Oncologist called us and said he checked in on Amber to see how she was doing, still having difficulty walking but doing ok. It was nice to hear from him. The Emergency Center called me at work early afternoon to say that they would be doing the procedure in the afternoon, and would call us after they completed the procedure to let us know how she was doing. It was now late afternoon and we had heard nothing, and started to get nervous. So my husband called, they had just finished, and Amber was resting comfortably, she did very well. They said we could either leave her there for the night or pick her up any time tonight. She needs rest and confinement, and we need to keep her from licking the surgical sight. We decided that it might be best to keep her there another night as Dakota might be the one to be licking her wound, and she could get the rest she needed more there then at home. After I got out of work we went to visit her. When they opened the door we heard 4 paws running, and thought this can’t be her, but to our amazement there she was running towards us, she looked great! It was almost like she was telling us that she was not ready to give up, and that she could still manage to walk on her own. Then within a few seconds she was on her behind. We visited with her for about an hour, hugging and kissing her as much as we could in that short period of time. We walked outside with her, and one of the nurses was showing us how to use the sling. This is supposed to take some of the weight off her hind legs and back, and make it easier for her to stand on all fours. She did very well and we hated to leave her, but figured it was best for her to stay another night. The Oncologist called again in the morning to let us know he had checked on Amber, at first he was a little discouraged as to how she was, since starting the new medication. Then he found out they didn’t start it until the morning, so he then felt better. We picked her up on Friday December 12th, with instructions and new meds. She was now taking Prednisone for 9 days, but tapering off during this time period. We were given the name of a Neurologist, to possibly have an MRI done. Scheduled an appointment for December 22nd. Amber did very well on the Prednisone, although it made her drink lots of water, and she wanted to eat all the time. This was ok as she was doing much better and now able to walk on her own, even though she still needed to be carried up and down stairs. She didn’t like being carried up and down stairs much and she sometimes fought it. I am sure she was confused and didn’t understand what was going on with herself. She had a few accidents in the house, where she would pee, but she was confined to the Kitchen when we weren’t home, just in case. When we started to wean her off the prednisone she started having trouble walking again, we were right back to where we started, back on the emotional roller coaster ride. Every time she regresses it is more difficult to handle. You start to get to a point of enjoying your days with her then boom the bomb drops, and the nightmare returns. On December 22nd we went to see the Neurologist. The Doctor looked at the records we brought with us and gave Amber a thorough neurological workup. The conclusion was that the problem is in the T3-L3 area on the right side. It is either disc disease or tumor (secondary). If disc disease, the only treatment is surgery, if tumor, you could do radiation therapy but the results are not that successful. If we choose for Radiation, then a MRI is in order, to try and pin point the exact location of the problem. Based on the Doctors finding’s and our new options, we decided that even if it were a disc problem we would not do surgery. Amber already has Cancer, and what’s the point? Since Radiation is not too successful on the spine then it is not worth pursuing this course of treatment either. We felt it was best to not put her through any more then she had already been put through. Enjoy what ever time we had left and make the best of a really bad situation. Doctor agreed, and recommended us to keep Amber on the Prednisone, indefinitely. It seemed to help her and made her comfortable, so why not continue? We can play with the dose to find the lowest dose that makes her comfortable, and increase it if we have to. Minimize her activity, with either of these conditions rest is the best medicine. Amber was doing great through Christmas and New Years, which made us very happy. On January 31st we went back to the Oncology group for blood work to make sure everything was ok, because of the steroids. The Doctor was amazed at how good she was doing, compared to the last time he saw her. She even jumped up to say hello to the girls, and decided it would work better to go around to the other side of the desk. Amber’s weight has dropped, but it is because she is loosing muscle tone, so he suggested we could up her calorie intake a little, since exercise is not an option. We left feeling somewhat encouraged that she might be ok for a longer period of time then we thought. About a week later Amber started to have some difficulty walking again, and she was so good a week ago. Other then going to the Doctors a week before, the only other thing that had changed was Prednisone from a different place. Thinking and hoping that the meds might not be working correctly we got another RX from the Oncologist. We felt that she might need a higher dose so we upped the dosage again figuring that we could then lower it in about a week if she was ok. We also decided to not let her do the stairs, and we would confine her to the basement unless we were home to watch her carefully. She seemed better on the higher dose, but still seemed unsteady when walking. My husband would carry her upstairs so she could be with us, as much as possible. On a few occasions we left the room and went upstairs for a half hour or so, came back downstairs to find out that she managed to go down to the basement on her own. We then thought why should we feel guilty, as she likes it in the basement and always has. So we would go down to the basement to spend time with her as much as possible. We would just bring her upstairs if we knew we would be able to stay with her and just put up the child gates. Amber was still eating, drinking water, and loving her treats, able to walk, and in no pain until the weekend of March 12th. Amber became more unsteady walking, her appetite was sluggish, and she wanted to be hand fed, she was more lethargic, but this had happened before and she would be better 1-2 days later. So of course this is what we were hoping for, but it didn’t happen this time. On March 14th we had 30 people at our house for our Grandsons 2nd Birthday. Some of our guests went down stairs to see Amber; she would wag her tail but was unable to get up on her own. I helped her up a few times so she could go to the gate and say hello. She seemed very happy and more alert, but she is a Golden, and loved being around people. Our company left and Rich and Krissy went downstairs to spend some time with Amber. I went down about a half hour later and Rich was lying on the floor hugging and kissing Amber, and he was crying. I gave him a hug, kissed Amber and left them alone. I felt Rich needed these moments with Amber as I have had, and besides Krissy was there to comfort him. Rich, Krissy and my Grandson Ryan left to go home. Before I went to bed that night I checked on Amber several times, she now seems to be having some difficulty breathing. I went to bed, but had trouble sleeping so I got up and checked on her again, but this time she had vomited. I cleaned it up and decided that I would not be able to get to sleep worrying about her. I decided to camp out with her in the basement. Part of our basement is finished with carpet, but I figured if she had another accident or vomited again, it would be much easier cleaning a floor instead of carpeting. I took her bed that she wasn’t using, put a few towels on it, got a blanket, a few pillows, and my television and laid next to her with my arm around her. Her breathing was erratic, sometimes fast, and sometimes slow; her heart was beating fast. I leaned over to her and gave her a big hug and kiss, and told her it was ok to let go. I had tears in my eyes, but I didn’t want her to sense me being upset. I tried to be strong. We had more time with her then I thought we were going to have. I am so very thankful for that extra time. I thought this was it she was going to die, but she didn’t. I must have fallen asleep for a while, as I woke up suddenly, when she moved at one point to change her position. She picked her head up a few times, and looked at me with those sad big brown eyes, as though to say I’m ready. Those big brown eyes have gotten to me many times over the years. Her eyes looked so sad for the first time since this all started, and I knew at this point that we needed to call the Vet and do what was now best for her. It just broke my heart to see her like this, and unable to do the things she enjoyed the most. We could not watch her suffer, and keep her around under these circumstances for much longer. Above, left: Last picture of Dakota with Amber, last day they had together. They both look so sad. Right: Amber & I during our last minutes before going into the Vets to have Amber put to sleep. She looks so sad. Amber was cremated, and her ashes, are back home with us, to sit next to our cat Jingles. So after spending like $2000.00, there was nothing we could do to save our Amber. All we have left now are her ashes, some pictures and almost 8 years of memories. But life does go on so we hang on to the memories and try to take one day at a time. We are thankful for those memories and the time we did have with Amber. She will always hold a special place in our hearts and she will never be forgotten. Dakota has been really sad without Amber, even though Amber was unable to run and play the last months of her life, Dakota would still go and lay down beside her. He knew she was here, and they were still company for each other. So after many discussions we decided to call the breeder we bought Amber from to see if she knows of any breeders that might have a litter of Goldens that might be available soon. 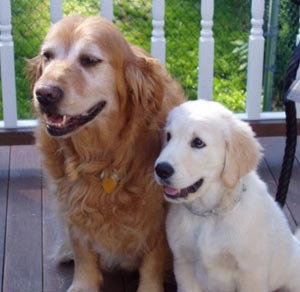 We knew that our previous breeder did not breed Goldens any more. So to make a long story short through her connections we found a breeder, who came highly recommended. She had a litter of 8 pups Born April 16, 2004. We visited the puppies at like 3 weeks; it was love at first sight. It brought lots of emotions to the surface, remembering the first time we saw Amber and her litter mates. We saw the pups 2-3 more times after this visit, and each visit was better then the previous. We decided we wanted a dog that looked different from Amber and we also wanted a Male for some of the same reasons. We had an opportunity this time to see both the Mother and Father of the pups. The Mother was a honey color and looked kind of like Amber, but smaller, with a very sweet disposition. The Father was much lighter almost white, about 65 Lbs, and also had a very sweet disposition. He is of Swedish/English descent, and we have heard that these dogs don’t have the illnesses that American bred dogs have, we hope this is true. We now have our new puppy home with us his name is Bosco. We forgot how much energy puppies have, he is very loving, stubborn, but learning the rules of our house. He is much like Amber was at this age, but yet very different. We love him like our other dog Dakota, and as we did Amber before him. 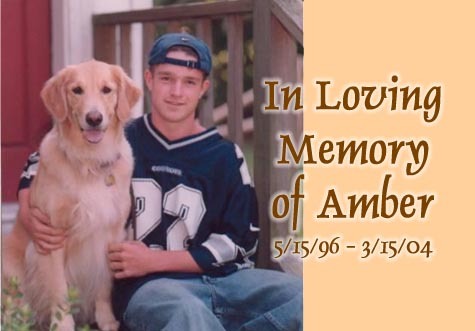 Amber will always be in our hearts, and will never be forgotten, no matter how many dogs we have in our life time. They are all special in their own right and bring much happiness to your home. We love animals and I don’t see us not having animals in our household any time soon. 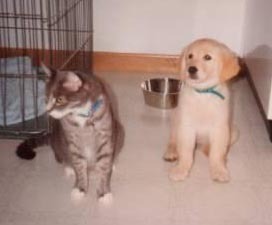 Left: Dakota (8 years old) with Bosco (3 months old). Message to Amber: We miss you so very much, but we know you are no longer in pain, not suffering any more and this makes us happy. There is now emptiness in our home and in our hearts. You brought much joy into our lives, during the almost 8 years you were with us. Thank you for the wonderful memories, we will hold them close to our hearts. We have been looking at photos and remembering all the great times we had together. We still have tears, but we also have smiles and laughter, when we think of you. Your life was cut short but, we want you to know that we loved you so very, very much and always will. Nobody can ever take your place!! Some days we feel you are still here with us, and inside Bosco. It’s almost like your legacy is still alive. Enjoy your new life, and we will see you again some day.